The only golf park in Richmond that has Grass Tees, Shade, and Bobby Lopez! Patterson Golf Park is home to the best grass tees in town. We have over twenty grass tees of lush green Hybrid Bermuda grass. You may chip from our grass tees which have measured targets to test your game. What better way to take your game to the next level this year. At Patterson Golf Park you will find a night-lit 35 stall driving range that is available for use from 10am to 10pm daily during the summer. The driving range provides regular flight golf balls and is set up with numerous targets at different distances to allow you to test both your distance and your accuracy. The driving range at Patterson Golf Park has 5 covered Tees allowing golfers to choose to be in the sun, or in the shade. We offer 3 sizes of baskets. Discount cards are available and provide significant savings to our frequent guests. Our on staff PGA Golf Pro, Bobby, is available to provide video analysis of your swing. In addition, Bobby provides individual and group lessons to improve your technique. Click here to get a taste of how Bobby can elevate your game. 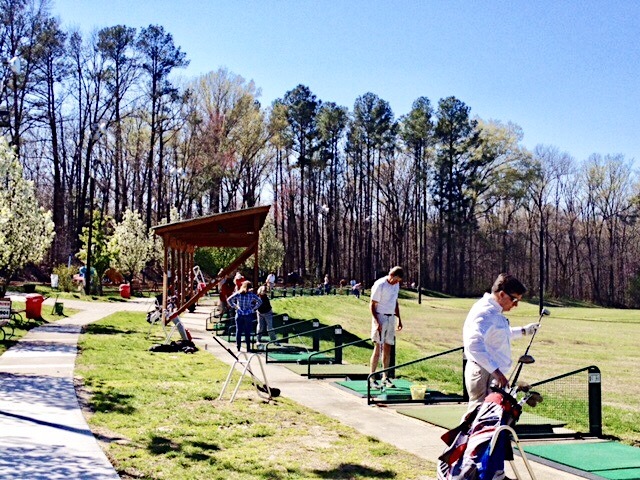 Head over to Patterson Golf Park and make time to perfect your swing and improve your golf game today.